THE ROCKET is one of those movies that is genuinely unique and original and touching and elucidating. Actually, as I list all those factors, I realise how unusual it is for a movie to be all of those things, as well as beautiful and well-acted. Yep, Australian direct Kim Mordaunt's movie is something to behold, and as it's Australia's submission to the Oscars, I'm hoping it gets even more recognition in the months ahead. The story is set in Laos - a country torn apart by US rockets in the 60s, and still governed by a Marxist dictatorship today. The movie focuses on a rural family, still living as subsistence farmers, with a culture coloured by superstition and governed by uncaring external forces. If all that suggests a movie that's going to be dour and earnest, you couldn't be more wrong. This movie has flashes of humour and eccentricity and joy that contrast with its environment. But at the same time, Mordaunt manages to convey a lot about the past and present horrors of Laos with a very light touch. The hero is a little kid called Ahlo, who's mother begged for his life when his grandmother wanted to kill him at birth: apparently Laotians believe that twins are cursed, and even as the only surviving twin, she doesn't believe that Ahlo is necessarily the one with the good luck, as opposed to the curse. And as the movie develops, we kind of agree with her: Ahlo's village is wiped out to make way for a dam, and the promise of resettlement is hollow. Still, on his travels he meets his sweetheart, a lovely little girl called Kia, and her eccentric, fantastic "Uncle Purple". He's a Laotian peasant who idolises James Brown, with tragicomic consequences. And, luckily for Ahlo, Uncle Purple also knows about munitions because of his childhood in a wartorn country. As a result, Ahlo is able to enter a village competition to create the most impressive rocket that will "poke the arse of the raingod" and bring the farmers fertile land. The resulting movie is heart-warming and joyous even as it's dark and subversive. The very fact of its existence is something of a miracle given the oppression in Laos - the non-professional actors - the delicate balance of frightening history and almost-fairytale story. But what can I say? The movie just works. And works so perfectly that you can't imagine a single image or scene or character being a few degrees different. It's a complete and unique movie that demands to be seen. THE ROCKET played Berlin 2013 where director Kim Mordaunt won Best Debut Film and the Crystal Bear and the Amnesty International Film Prize. It played Tribeca 2013 where it won the Audience Award - Narrative, and Best Narrative Feature and Sittiphon Disamoe won Best Actor - Narrative Feature. 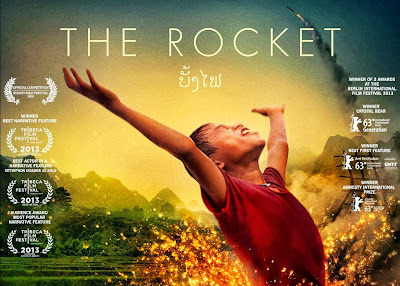 THE ROCKET was released in Australia in August. It has a running time of 96 minutes.